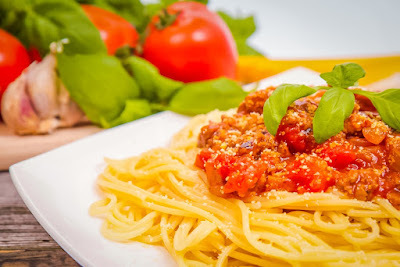 We all want to cook quickly as time is precious and we don't seem to have much of it, so why not try this delicious Microwavable Spaghetti Bolognese. This microwaveable recipe is courtesy of The Ideas Kitchen which has a host of delicious recipes as well as some simple microwavable recipes which are mainly cooked using a flatbed microwave which allows the food to cook more evenly. 1-Place all of the Bolognese ingredients into the bowl. 2-Cover with pierced cling film. 3-Cook on high in the microwave 10 mins. Then on a medium for another 15-20, In the meantime, prepare your spaghetti by heating on the hob in a large pot of boiling water. 4-Serve with the spaghetti sprinkled with basil leaves.